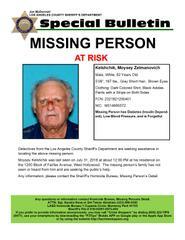 Los Angeles County Sheriff’s Department’s Missing Persons Unit detectives are asking for the public’s help in locating Moysey Zelmanovich Kelshchik. 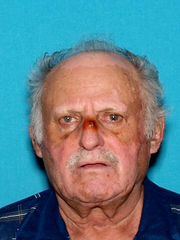 He is an 82 year-old male White who was last seen at his residence on the 1200 block of Fairfax Avenue, West Hollywood, on Tuesday, July 31, 2018, at approximately 12:00 p.m.
Mr. Kelshchik is described as 5’09” tall, 167 lbs., short grey hair, and brown eyes. He was last seen wearing a dark colored shirt, and black Adidas pants with a stripe on both sides. He suffers from diabetes (insulin dependent), low blood pressure and is forgetful. He primarily speaks Russian. Mr. Kelshchik’s family has not seen or heard from him. They are very concerned and asking for the public’s help in located him.